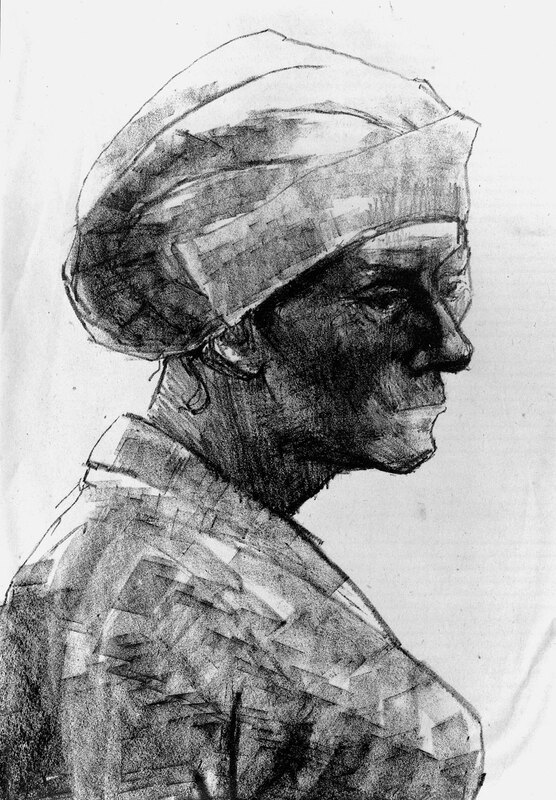 description A head-and shoulders profile portrait of a woman seen in three quarter face view, facing right. She wears overalls and a large cap, from which one rebellious curl has escaped at the nape of her neck. The artist herself served as a counterhand and washer-up at Lyons Corner House, Piccadilly, between 1951 and 1956, where she made many empathetic portraits of her fellow workers. exhibition history 'Eva Frankfurther 1930-1959: Memorial Exhibition', Boundary Gallery, London, 15 June-18 July, 2001, (88), as 'Counterhand, Lyons Corner House', £200. literature ed., B. Planskoy, 'Eva Frankfurther 1930-1959: Paintings, lithographs and drawings' (London: Peter Halban, 2001), illus. p. 22.